When I was a younger man that frequented crowded bars, beer out of the bottle was ideal because my only concern was not spilling or splashing my beer if I was bumped into. I held my beer by the neck with my index and pinky finger like a douche. As I slowly stopped going to those kind of places and really started exploring beer I realized the importance of pouring my beer into a glass. When pouring a beer into a glass it must be poured with some vigor. To truly enjoy a beer a good head of foam is essential. The size and retention of the head can vary by style, but it has to be there at least initially. No bueno. When pouring a tallboy into a glass, please pour it the same way you would a 12 ounce bottle. I start along the edge, and when the glass is 80% full I'll pour in the middle. At this point it is like driving a stick shift, I know when I need to change gears. If I am pouring one of my homebrews with low carbonation, I might pour the beer in the middle of the glass the entire time. If this is how John Kimmich drinks out of a tallboy can, this is how you should drink out of a tallboy can. This is a beer I brewed earlier this year primarily for a HomebrewTalk post about fruited IPAs. The batch was infected and I dumped the entire six gallons. The only silver lining is that I didn't waste more hops on a second dry hop. A long time ago Jennie and I set up a Twitter account for our home brewery. Every now and again I get Twitter alerts for that account. One day I received an alert for a tweet with a link to a Beer Advocate thread entitled: "Is West Coast IPA still relevant?" My answer is yes, of course it is! Some drinkers are so into and obsessed with New England Pale Ales and IPAs that perhaps those drikers feel that West Coast IPAs may no longer relevant. Some are so involved in their beer geekdom that they forget that not every craft beer drinker wants to wait in line at or trade for Tree House or Trillium. The craft beer drinkers that buy beer at a store are still buying plenty of West Coast and Midwest IPAs. Modern West Coast IPAs from the San Diego area and New England IPAs are more similar than they are different. Neither type of IPA is overly bitter and both are highly aromatic. If you served a San Diego IPA and a Vermont IPA to a blind-folded drinker that hunts "whalez", that drinker would have a harder time than they would think discerning the difference in flavor between the two. In one blind tasting I actually preferred Port Wipeout IPA, a San Diego IPA that goes for $7 a bomber, to Heady Topper. Beer drinkers in general need to be more aware that they don't know what they don't know, and that Beer Advocate, RateBeer, or Untappd ratings are everything. Digressing to my brew day, I dry-hopped my last New England IPA so aggressively that my three gallon batch only resulted in 24 bottles. As happy as I was with it, the beer went quickly. I needed to make another IPA soon. As much as I wanted to make another New England IPA, I already had most of the hops I needed to make another batch of Broken Fist. When I think of Southern California I think of sunshine. With summer coming, a SoCal-inspired IPA will hit the spot. I have always hopped Broken Fist a little bit like a New England IPA with a small dry hop addition toward the end of active fermentation. That first dry hop is smaller than I would employ with a New England IPA, but it's there to boost up the hop flavor. Beyond the hopping, Broken Fist is more of a conventional West Coast IPA. In my West Coast-inspired IPAs like Broken Fist and The Anti-Chris, I still use water high in sulfates to yield a beer that is dry and accentuates the hop flavor, whereas in my latest New England IPA I flipped convention on it's head and brewed with water high in chlorides. I use generic US 2-row malt for the most part, and WLP090 San Diego Super yeast to produce a purely hop driven beer. And yes, I use kettle finings in my West Coast IPAs to try and make a beer that is reasonably clear. 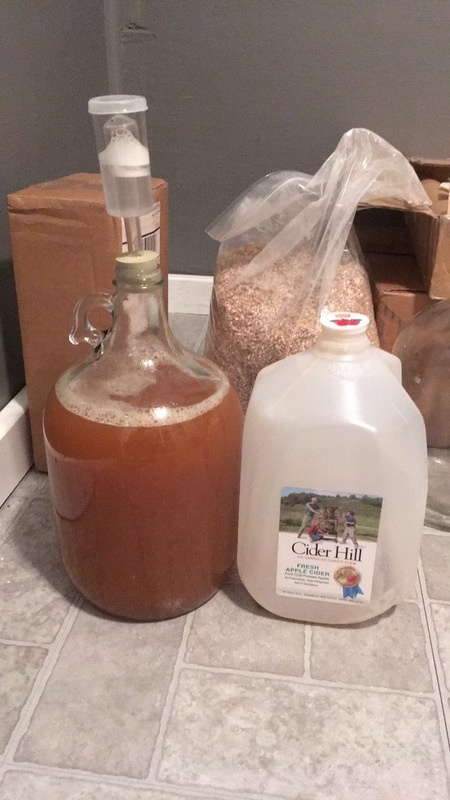 I brewed an all-grain, six gallon double batch. I employed the same double boil that I did for the North Shore Brewers Wee Heavy. After primary fermentation, I am going to split the batch. Half of the batch will be dry hopped as normal, while I will add grapefruit peel to the other half. The split batch will be for a post on another website. Citrus IPAs and pale ales aren't going anywhere, so I may as well try to make one. Fittingly now that my last cider is finally in a keg, I have a new cider fermenting. Yeast and bacteria are all around us. It is natural and it is unavoidable. A fresh-pressed juice from an apple orchard by law does not have to be pasteurized. If you buy a jug at your local orchard that is not pasteurized, the jug will likely be adorned by some type of warning. As a result, any yeasts or other microorganisms on the apple when it was pressed are in the juice. Thus it is possible to ferment juice into cider without adding yeast. Recently my friend Doug offered to pick up five gallons of fresh-pressed juice from an orchard in Amesbury, Mass. After he dropped the juice off, I decided to take one of the five gallon jugs, pour it into a one gallon growler, and let it spontaneously ferment to see what kind of unique flavors I might get. Doesn't get more fresh than this! Much to my surprise the juice had already started to ferment. Most micro-organisms go dormant at refrigerator temperature. The CO2 that was produced caused the jugs to swell. When I broke the seals, I had to bleed off the pressure. One of the juges even gushed. Luckily I aimed the gushing juice right into a funnel. sulphury, but tasted okay. To de-gas I may rack the cider again, but it probably just needs time. The ability to keg and force carbonate gives more more room to experiment. I can sulphate and back-sweeten a cider with apple juice concentrate or un-fermented juice without worrying about yeast re-fermenting the added sugars. When I finally built my keezer, my last cider was one of the first three beverages I put on tap. Cider is so easy to make I should try to keep on one draft all the time.